Improve conversion rates and sell more products with our seasoned team of ecommerce experts. With online shopping continuing to grow in popularity, our team of ecommerce experts can help ensure your website is performing as it should. Well versed in the latest ecommerce strategy trends, we've helped our clients increase sales over 1500%. Increase sales on your website by following our guide for industry best practices. Help your customers use your website easier. Improve the findability of your products. Through the use of several techniques, we can help you keep your customers coming back. 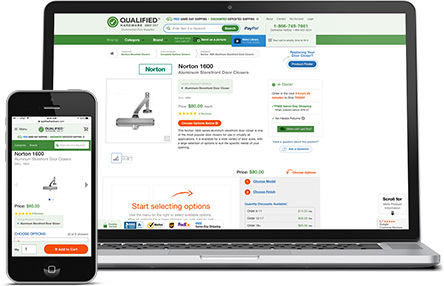 We helped QualifiedHardware.com become the #1 name in commercial door hardware by crafting a custom user experience and brilliant design that make shopping a breeze.